The organization also urged INEC to investigate the sources of other cases of apparently unexplained campaign financing and contributions for the 2015 elections by politicians and supporters of the two main political parties that is, the APC and the Peoples Democratic Party (PDP). It urged INEC to collaborate with the Independent Corrupt Practices and Other Related Offences Commission (ICPC) and the Economic and Financial Crimes Commission (EFCC) in any such investigation. SERAP in the letter dated 17 November 2018 and signed by its senior legal adviser Bamisope Adeyanju, said: “Allegation that one politician spent billions of Naira on elections in several states of the country to support a political party if not thoroughly, and transparently investigated and prosecuted would undermine the public faith in the country’s democracy. It also risks distorting electoral processes and reversing the gains in the democratic and electoral processes that have been recorded since the return of democracy in 1999. The letter copied to Ibrahim Mustafa Magu, Acting Chairman EFCC; Dr. Musa Usman Abubakar, Acting Chairman, ICPC; and Professor Itse Sagay, Chairman, Presidential Advisory Committee Against Corruption (PACAC) read in part: “Unexplained and unregulated spending to influence the outcome of any election can distort the electoral competition and lead to state capture by wealthy politicians and individuals. “SERAP urges you to prosecute anyone suspected to be involved and/or complicit in the alleged unexplained campaign spending, if there is relevant and sufficient admissible evidence of violations of international standards and national laws. We request that you take steps within 14 days of the receipt and/or publication of this letter, failing which SERAP will institute legal proceedings to compel you and the INEC to discharge your constitutional and statutory responsibilities in the public interest. “Unexplained and unregulated spending on election campaign would encourage politicians to divert public resources for political purposes rather than ensuring and directing critical spending for socio-economic development of the country, including on improving access to public services such as electricity, health, water, and education. “Campaign financing such as the spending allegedly disclosed by the Senate president undermines public trust and confidence in politicians and poses serious corruption risks, as it can blur the line between state and party politics, encourage the use of national resources to fund and influence elections. Such huge spending by an individual can even be converted into a conduit for money laundering. “SERAP urges you to publicly clarify to politicians and political parties ceilings for campaign spending and contributions, and to insist that all political parties and politicians disclose sources of their spending for the 2019 elections. INEC should also require all political parties to sign ‘transparency pacts’ that would mandate candidates and their sponsors to disclose the identities of donors and publish all spending and contributions on their party website and in the press before the 2019 elections. 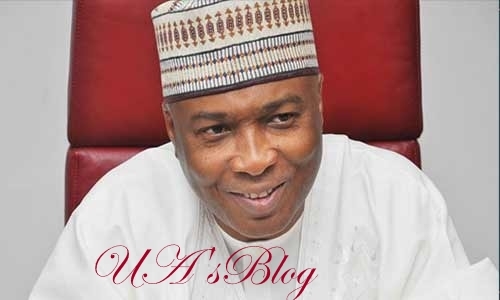 “SERAP, therefore, urges you to investigate the sources of campaign financing and contributions by Saraki and by other politicians and other individuals to APC and PDP if INEC is ever to rein in the role of money and level the playing field for candidates and political parties in the 2019 general elections”.